Happy Easter to all who celebrate it. Today is Good Friday but the celebrations shouldn’t begin until Sunday. Europe and America are off today which means the forex market is almost dead. However, there is some minimal price action. 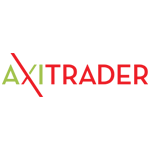 EUR/USD has moved around 40 pips so far and we’re thinking of opening a forex signal there. But let’s see what’s going on with EUR/CHF first, since we have an open signal here. This forex pair has been sliding lower in the last 24 hours. Since the main trend is up, we saw this move lower as an opportunity to go long yesterday which we did at 1.1767. 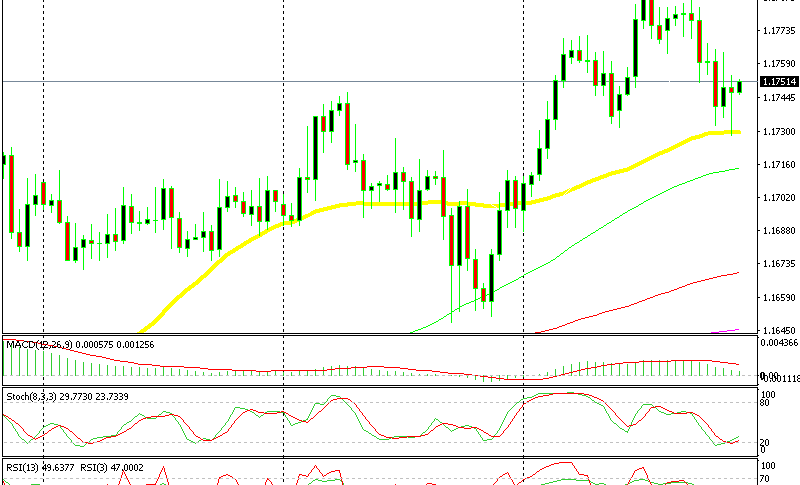 Price was finding support at the 50 SMA (yellow) on the hourly chart. The retracement was complete on this time frame. But the slide continued and now we see that the market was really trading the H4 chart instead of the H1 chart. 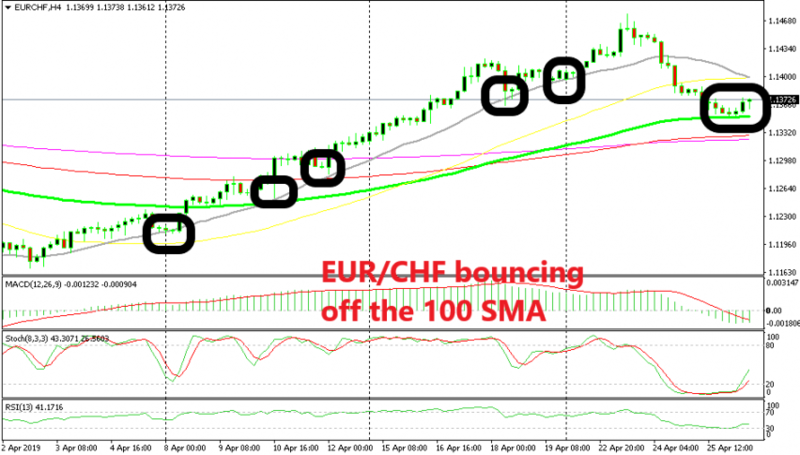 EUR/CHF kept sliding until it reached the 50 SMA on this time frame. Sellers kept pushing lower and this pair kissed the 50 SMA a few hours ago. Price pulled back up after touching that moving average and forming a hammer. 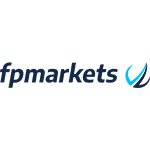 The hammer is a reversing signal which suggests this pair might reverse higher. 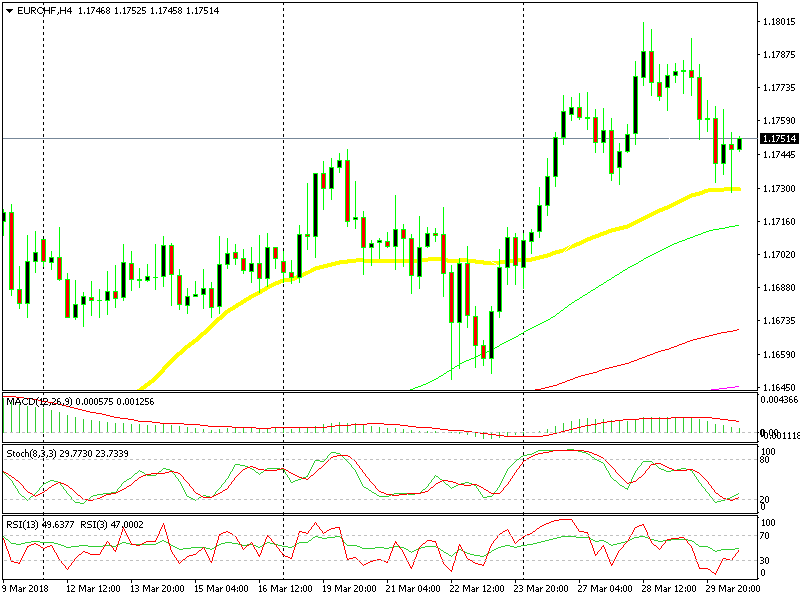 The stochastic indicator for EUR/CHF is oversold on the H4 chart. This is the typical reversal pattern: the trend is bullish, the stochastic is oversold and the candlesticks are pointing to a reversal. Let’s hope we get a present for Easter.